@LDN_Culture @justinesimons1 @artfund @GovArtCol @WFculture19 Where can we get a hold of one? 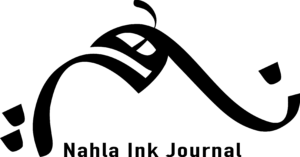 Just a quick note to update you with Nahla Ink’s April news. Firstly, a big thank you to British-Syrian poet Amir Darwish whom I interviewed last week about his latest poetry collection ‘Dear Refugee’. He patiently allowed me to ask him lots of questions that delve into his refugee story and how he arrived in the UK hanging underneath a lorry on a cross-channel ferry from France in 2003. Secondly, another big thank you to my artist of the month, the British-Jordanian Rawan Adwan. Her featured work on Nahla Ink has been inspired by the Safaitic inscriptions and rock art to be found in the basalt desert of southern and norther Jordan aka Harrah desert. Thirdly, for those who haven’t already seen the new design, in order to find the listing of MENA-inspired arts and culture events in London, you just need to scroll down the home page to find them all under the ‘Arab About London’ heading. Lastly, if you have an event that you would like to add to my listing, please do get in touch.